Lysophosphatidic acid (LPA) exerts a variety of biological responses through specific receptors: three subtypes of the EDG-family receptors, LPA1, LPA2, and LPA3 (formerly known as EDG-2, EDG-4, and EDG-7, respectively), and LPA4/GPR23, structurally distinct from the EDG-family receptors, have so far been identified. In the present study, we characterized the action mechanisms of 3-(4-[4-([1-(2-chlorophenyl)ethoxy]carbonyl amino)-3-methyl-5-isoxazolyl] benzylsulfanyl) propanoic acid (Ki16425) on the EDG-family LPA receptors. Ki16425 inhibited several responses specific to LPA, depending on the cell types, without any appreciable effect on the responses to other related lipid receptor agonists, including sphingosine 1-phosphate. With the cells overexpressing LPA1, LPA2, or LPA3, we examined the selectivity and mode of inhibition by Ki16425 against the LPA-induced actions and compared them with those of dioctyl glycerol pyrophosphate (DGPP 8:0), a recently identified antagonist for LPA receptors. Ki16425 inhibited the LPA-induced response in the decreasing order of LPA1 ≥ LPA3 » LPA2, whereas DGPP 8:0 preferentially inhibited the LPA3-induced actions. Ki16425 inhibited LPA-induced guanosine 5′-O-(3-thio)triphosphate binding as well as LPA receptor binding to membrane fractions with a same pharmacological specificity as in intact cells. The difference in the inhibition profile of Ki16425 and DGPP 8:0 was exploited for the evaluation of receptor subtypes involved in responses to LPA in A431 cells. Finally, Ki16425 also inhibited LPA-induced long-term responses, including DNA synthesis and cell migration. In conclusion, Ki16425 selectively inhibits LPA receptor-mediated actions, especially through LPA1 and LPA3; therefore, it may be useful in evaluating the role of LPA and its receptor subtypes involved in biological actions. Lysophosphatidic acid (LPA) has been shown to elicit diverse biological actions, including Ca2+ mobilization, change in cAMP accumulation, change in cell shape and motility in association with actin rearrangement, and proliferation in a variety of cell types (Moolenaar, 1999; Contos et al., 2000; Ye et al., 2002). Extracellular LPA has also been shown to be involved in certain diseases, such as atherosclerosis and cancer (Xu et al., 1995, 2001; Siess et al., 1999; Maschberger et al., 2000). LPA was first thought to be released from activated platelets; however, a major part of extracellular LPA has been shown to be produced from lysophosphatidylcholine by lysophospholipase D, which was previously called autotaxin (Sano et al., 2002; Tokumura et al., 2002; Umezu-Goto et al., 2002). The concentration of plasma LPA is about 100 nM, and its serum concentration can be as high as 5 μM (Sano et al., 2002). LPA increases low-density lipoprotein during its oxidation, activates endothelial cells (Siess et al., 1999; Maschberger et al., 2000), and has also been identified as a growth-promoting factor for cancer cells in malignant ascites of patients suffering from ovarian cancer (Xu et al., 1995; Xu et al., 2001). These cellular responses to LPA are mediated through G-protein-coupled receptors, and several subtypes of LPA receptors, including LPA1/EDG-2, LPA2/EDG-4, LPA3/EDG-7, and LPA4/GPR23, a non-EDG-family LPA receptor, have been identified (Hecht et al., 1996; An et al., 1998a,b; Bandoh et al., 1999; Moolenaar, 1999; Contos et al., 2000; Im et al., 2000; Ye et al., 2002; Noguchi et al., 2003), although a novel intracellular mechanism through peroxi-some proliferator-activated receptor γ was recently demonstrated (McIntyre et al., 2003). These LPA receptor subtypes are expressed and function in a variety of cell types; however, the precise role of each LPA receptor subtype has not yet been fully characterized. Receptor antagonists are very useful tools for evaluating the role of LPA and its receptors in biological actions and for controlling specific diseases (Tigyi, 2001). Based on their ability to inhibit Ca2+ response to LPA in A431 cells or LPA-responsive cells, we have screened 150,000 low-molecular-weight compounds developed by the Kirin Brewery Co. Ltd, for LPA receptor antagonists, and found that some isoxazole derivatives showed such an inhibitory activity against the LPA action. We therefore synthesized several isoxazole derivatives and finally selected Ki16425 as the best candidate compound (Ueno et al., 2001). In the present study, we examined the pharmacological properties of Ki16425 and compared it with that of DGPP 8:0, a recently identified LPA antagonist (Fischer et al., 2001). We found that Ki16425 inhibited LPA-induced actions in a manner highly specific to LPA and LPA receptor subtypes. Such differences in the selectivity of Ki16425 and DGPP 8:0 were successfully applied to discriminate the receptor subtypes in A431 cells. Thus, the novel antagonist Ki16425 seems to be a useful tool for investigating physiological and pathophysiological roles of LPA and its receptors. Materials. 1-Oleoyl-sn-glycero-3-phosphate (LPA), l-α-lysophosphatidylcholine palmitoyl (C16:0), l-α-lysophosphatidylcholine β-acetyl-γ-O-alkyl (PAF), and 1-β-d-galactosylsphingosine (psychosine) were purchased from Sigma-Aldrich (St. Louis, MO); sphingosine 1-phosphate (S1P) was from Cayman Chemical Co. (Ann Arbor, MI); sphingosylphosphorylcholine (SPC) was from BIOMOL Research Laboratories, Inc. (Plymouth Meeting, PA); 2-arachidonoylglycerol and fatty acid-free BSA (Fraction V) were from Calbiochem-Novabiochem Co. (San Diego, CA); dioctyl glycerol pyrophosphate (DGPP 8:0) was from Avanti Polar Lipids, Inc. (Alabaster, AL); Fura 2/AM was from Dojindo (Tokyo, Japan); PTX was from List Biological Laboratories, Inc. (Campbell, CA); [myo-2-3H]inositol (23.0 Ci/mmol) was from American Radiolabeled Chemicals, Inc. (St. Louis, MO); [35S]GTPγS (1,200 Ci/mmol) was from Amersham Biosciences, Inc. (Piscataway, NJ); and [3H]LPA (48 Ci/mmol) was from PerkinElmer Life Science Products, Inc. (Boston, MA). Ki16425 was synthesized by Kirin Brewery Co. (Takasaki, Japan), and its chemical structure is shown in Fig. 1. Preparation of LPA Receptor cDNA Plasmids and Expression. The entire coding regions of LPA1 (1,095 bp, GenBank accession number Y09479), LPA2 (1,149 bp, GenBank accession number AF011466), and LPA3 (1,148 bp, GenBank accession number AF127138) were amplified from human cDNA library by RT-PCR. The respective amplified fragment was subcloned into the EcoRI site of pEFneo eukaryotic expression vector (Kon et al., 1999; Sato et al., 2000), and each DNA sequence was confirmed. The primers used for the RT-PCR were as follows. The 5′primers contained an EcoRI site, a Kozak sequence (CCACC), and the N-terminal region of the respective receptor. The 3′-primers contained an EcoRI site and a stop codon in addition to the C-terminal region of the respective receptor. CHO cells or RH7777 cells were transfected with pEFneo empty vector alone or the pEFneo vector containing human LPA1, human LPA2, or human LPA3 by electroporation, and the neomycin-resistant cells (G418 sulfate at 1 mg/ml for CHO cells and 0.3 mg/ml for RH7777 cells) were selected. CHO cells resistant to G-418 were used in bulk, whereas RH7777 cells expressing the different LPA receptor subtypes were cloned by limiting dilution. Subsequently, clonal RH7777 cells expressing human LPA2 (C3) and human LPA3 (C5) were isolated. However, in the early stages of the experiments, we were unable to obtain stable human LPA1 RH7777 cells; therefore, we used a stable mouse LPA1-expressing clone of RH7777 cells, which was provided by Prof. Kevin R. Lynch of the University of Virginia School of Medicine (Im et al., 2000). Human LPA1 cDNA was also subcloned into the HindIII/BamHI site of pcDNA3. Human and mouse orthologs of LPA1 subcloned into pcDNA3 vector (Im et al., 2000), provided by Prof. Kevin R. Lynch, were transfected into HEK293T cells. Cell Culture. THP-1, HL-60, and A431 cells were cultured in RPMI 1640 media supplemented with 10% (v/v) FBS (Sigma) (Okajima and Kondo, 1995); Swiss 3T3 fibroblasts, S1P receptor-transfected CHO cells (Kon et al., 1999), and LPA receptor-transfected CHO cells were cultured in Dulbecco's modified Eagle's medium supplemented with 10% (v/v) FBS; and LPA receptor-transfected RH7777 cells and HEK293T cells were cultured in minimum essential medium supplemented with 10% (v/v) FBS. FRTL-5 thyroid cells and PC-12 cells were cultured as described previously (Sho et al., 1991; Sato et al., 1997). For cAMP assay, RH7777 cells were plated to dishes coated with rat tail collagen (400 μg/ml). Twenty-four hours before experiments, the medium was replaced with serum-free medium as specified containing 0.1% (w/v) BSA (fraction V). In the case of the inositol phosphate response, the medium was changed to TCM199 medium containing 20 μCi of [3H]inositol (in 6 ml) and 0.1% (w/v) BSA (fraction V). Where indicated, PTX (100 ng/ml) or its vehicle (final 2 mM urea) was added to the culture medium 24 h before experiments. As for GTPγ35S binding and [3H]LPA binding assays, each receptor plasmid DNA (6 μg) encoding mouse LPA1, human LPA1, human LPA2, or human LPA3 was mixed with plasmids encoding the C352G rat mutant of Gi2α (6 μg), bovine β1(6 μg), and γ2 subunits (6 μg) (Tomura et al., 1997), and transfected into HEK293T cells using calcium phosphate precipitate method (Im et al., 2000). After 24 h, the medium was changed to fresh minimum essential medium supplemented with 10% (v/v) FBS and cells were cultured for an additional 24 h. The cells were maintained for about 6 h in the fresh medium (without serum) containing 0.1% (w/v) BSA (fraction V), and membranes were prepared as described previously (Kon et al., 1999). Measurements of [Ca2+]i. THP-1 and HL-60 cells were harvested by centrifugation (250g). RH7777 cells transfected with LPA receptors were washed with Ca2+- and Mg2+-free phosphate-buffered saline containing 4 mM EGTA at 37°C for ∼5 to 10 min and then harvested. Other cells were harvested with trypsin (0.05%) after washing with Ca2+- and Mg2+-free phosphate-buffered saline containing 4 mM EGTA. The cells were centrifuged at 250g, and pelleted cells were resuspended in Ham's 10 medium containing 0.1% BSA and incubated with 1 μM Fura 2/AM for 20 min. The cells were washed twice and resuspended in the HEPES-buffered medium. The HEPES-buffered medium was composed of 20 mM HEPES, pH 7.4, 134 mM NaCl, 4.7 mM KCl, 1.2 mM KH2PO4, 1.2 mM MgSO4, 2 mM CaCl2, 2.5 mM NaHCO3, 5 mM glucose, and 0.1% (w/v) BSA (fraction V). [Ca2+]i was estimated from the change in the fluorescence of the Fura 2-loaded cells, as described previously (Okajima et al., 1998; Kon et al., 1999). Unless otherwise stated, the cells were incubated for 1 min in the presence or absence of Ki16425 or DGPP 8:0, and indicated agonists were added to the incubation medium to monitor [Ca2+]i. The net [Ca2+]i change (peak value - basal value) at around 15 s was calculated. Inositol Phosphate Production. Assays were performed essentially as described previously (Murata et al., 2000). The cells were incubated for 1 min with or without test agents, and the inositol phosphates (sum of inositol bisphosphate and inositol trisphosphate) were measured. The results were normalized to 105 dpm of the total radioactivity incorporated into the cellular inositol lipids, and the radioactivity of trichloroacetic acid (5%)-insoluble fraction was considered as the total radioactivity. cAMP Accumulation. The cells were washed once and preincubated for 10 min at 37°C in HEPES-buffered medium. FRTL-5 thyroid cells were incubated with LPA or other agonists in the presence or absence of Ki16425. Forskolin (10 μM), 100 μM Ro20-1724, and 0.5 units/ml adenosine deaminase were added to the medium. S1P1-transfected CHO cells were similarly incubated with test agents. In this case, the incubation medium contained 10 μM forskolin and 0.5 mM 3-isobutyl-1-methylxanthine. After a 10-min incubation, the reaction was terminated by adding 100 μl of 1 N HCl, and cyclic AMP was measured as described previously (Sho et al., 1991). GTPγ35S Binding. Binding assay was performed by incubating the membranes with 0.1 nM GTPγ35S (∼2 × 105 dpm/ml) for 30 min at 30°C, as described previously (Im et al., 2000). [3H]LPA Binding. Membrane protein (40 μg) was incubated in 0.4 ml of the binding buffer (50 mM HEPES, 100 mM NaCl, 5 mM MgCl2, pH 7.5) containing 25 μg/ml of saponin, 0.05% BSA, 0.5 mM Na3VO4, 5 nM [3H]LPA (48 Ci/mmol), and different concentrations of Ki16425 and LPA for 60 min at 4°C. The reaction was terminated and binding activity was measured as for GTPγ35S binding assay. Nonspecific binding was determined in the presence of 10 μM unlabeled LPA. RNA Extraction and Northern Blot Analysis. Total RNA was prepared from the cells using TRIzol (Invitrogen, Carlsbad, CA) according to the manufacturer's instructions. Total RNA (20 μg) was electrophoresed in a 1% agarose gel containing 3.7% formaldehyde in 20 mM MOPS buffer, and blotted to a nylon membrane (Hybond-N) with 20× standard saline citrate. The probes (20 ng) were labeled with [α-32P]dATP by random oligonucleotide priming and added to the blots at a concentration of about 5 × 106 dpm in 5 ml of hybridization buffer. The hybridization was carried out at 60°C. After hybridization, the blots were washed at 60°C with 0.2× standard saline citrate and 0.1% SDS, as described previously (Sato et al., 1999). RT-PCR Analysis. Single-strand DNA was synthesized using the SUPERSCRIPT II kit (Invitrogen). To ensure that no genomic DNA contamination was present, the reaction was performed in parallel without reverse transcriptase. The product was then subjected to amplification by PCR. Degenerate DNA primers were based on the cDNA sequences of the human LPA1 (GenBank accession number Y09479), human LPA2 (GenBank accession number AF011466), and human LPA3 (GenBank accession number AF127138), according to the previous study (Pages et al., 2001) with slight modifications. The primers for LPA4 were synthesized according to the cDNA sequence of the human GRP23 (GenBank accession number NM005296). The primers used were: LPA1: forward, 5′-682ATCTTTGGCTATGTTCGCCA701-3′; reverse, 5′-1076TTGCTGTGAACTCCAGCCA1058-3; LPA2, forward, 5′-248TGGCCTACCTCTTCCTCATGTTCCA272-3′; reverse, 5′-716AGGCTGAGCGTGGTCTCTCGGTAGC692-3′; LPA3: forward, 5′-51AGTGTCACTATGACAAGC67-3′; reverse, 5′-563GAGATGTTGCAGAGGC548-3′; and LPA4: forward, 5′-567TGAAGGCTTCTCCAAACGTGTCTG590-3′; reverse, 5′-909GTTCAGAGTTGCAAGGCACAAGGT886-3′. The primer sequences in these regions were identical for the human and mouse, except for the reverse primer of mouse LPA2, which was 5′-AGGCTGAGTGTGGTCTCTCGGTAGC-3′. Primers for the human orthologs were effective for amplification of mouse (3T3 fibroblasts) and rat (PC-12 cells) LPA2 cDNA. Each PCR was carried out using 2.5 units of Taq DNA polymerase and 1 μl of reverse transcriptase reaction product in a 50-μl reaction mixture containing 20 mM Tris-HCl, pH 8.4, 50 mM KCl, 1.5 mM MgCl2, 200 μM dNTP, and 10 pmol of each primer. An extended denaturation at 94°C for 3 min was followed by 30 cycles, consisting of denaturation at 94°C for 45 s, annealing at 50°C (LPA1), 50°C (LPA2), 47°C (LPA3), and 52°C (LPA4) for 30 s, and elongation at 72°C for 1 min. After final extension at 72°C for 10 min, the PCR products were analyzed by agarose gel electrophoresis. DNA Synthesis. Swiss 3T3 fibroblasts were pretreated for 10 min with Ki16425 in fresh Dulbecco's modified Eagle's medium containing 0.1% BSA and then cultured for 20 h with LPA, S1P, or PDGF, and with [3H]thymidine (0.5 μCi in 1 ml) for another 4 h. The radioactivity in trichloroacetic acid-insoluble fraction was measured as described previously (Kimura et al., 2000). Cell Migration. The migration experiment was performed using a Boyden chamber apparatus (Neuro Probe Inc., Gaithersburg, MD) as described previously (Tamama et al., 2001). Cells remaining on the upper surface of the filters were removed, and the filters were then fixed in methanol and stained with Diff-Quik Solution II (International Reagents Corp., Kobe, Japan). The number of cells that had migrated to the lower surface was determined by counting the cells in four microscopic fields at 400× magnification. Calculation of Ki Value. The Ki values for Ki16425 or DGPP 8:0 were estimated from inositol phosphate responses or Ca2+ responses, based on the following equation: Ki = (EC50 × B)/(EC50′ - EC50), where B is the concentration of Ki16425 or DGPP 8:0, and EC50 and EC50′ are the half-maximal effective concentration of LPA in the absence and presence of the antagonist, respectively. The half-maximal effective concentration was estimated as a value that graphically gives a 50% maximal response, unless otherwise specified. With regard to the Schild regressions, the half-maximal effective concentration was estimated from the Scatchard plots. The Ki value was determined by plotting the log of Dose Ratio-1 at each concentration of Ki16425 against the log concentration of Ki16425. The x-intercept of the linear transformation equals the inverse log of the Ki. Statistical Analysis. All experiments were performed in duplicate or triplicate, and the results of multiple observations were presented as means ± S.E. of at least three independent experiments, unless otherwise stated. Statistical significance was assessed by Student's t test and values were considered significant at p < 0.05. Pharmacological Characterization of Ki16425. From 150,000 low-molecular weight compounds screened for selective antagonist action on LPA receptors, Ki16425 was identified as the best candidate (Fig. 1). When we started this study, EDG-family LPA receptors, but not LPA4/GPR23, had been identified. To study pharmacological characteristics of the compound, EDG-family LPA receptor subtypes were transfected into RH7777 cells, which have previously been shown to express none of these LPA receptors in a detectable level (Im et al., 2000). No significant increase in [Ca2+]i, increase in inositol phosphate production, or inhibition of cAMP accumulation in response to LPA could be found in wild-type or vector-transfected RH7777 cells (data not shown). LPA induced inositol phosphate production in a dose-dependent manner with different efficacy and potency in cells transfected with the different receptor subtypes. In the case of LPA1 and LPA3, 1 μM Ki16425 treatment slightly but significantly suppressed the LPA action, and the inhibitory effect became pronounced at 10 μM. On the other hand, the inhibitory effect of 10 μM Ki16425 in LPA2-expressing cells was marginal, although significant, in the ∼0.1 to 1 μM concentration range of LPA. In all cases, Ki16425 showed a competitive inhibition pattern, and Ki values were estimated to be 0.34 μM for LPA1, 6.5 μM for LPA2, and 0.93 μM for LPA3, as shown in Table 1. A similar selectivity of Ki16425 was observed to the Ca2+ responses in RH7777 cells expressing the different receptor subtypes (data not shown). The Ki values were estimated from inositol phosphate response shown in Fig. 2 (left column) or from the GTPγS binding assay shown in Fig. 3 (right column), in a manner similar to that for the inositol phosphate response for LPA2 and based on the Schild regressions for other receptor subtypes. See more detail under Materials and Methods. To further characterize the actions of Ki16425, we performed GTPγS binding assays in membranes prepared from HEK293T cells transfected with cDNAs encoding the LPA receptors and G-protein subunits. In this experiment, we also compared the effects of Ki16425 on the mouse and human orthologs of LPA1. As shown in Fig. 3, LPA receptor transfection introduced an increase in GTPγS binding activity in response to LPA. Consistent with a previous study (Im et al., 2000), the potency of LPA was slightly lower for LPA3 than for LPA1 or LPA2. Ki16425 competitively inhibited the LPA-induced action with different potencies, depending on the LPA receptor subtype, and Ki values were calculated from Schild regressions and presented in Table 1. These values were similar to those estimated from the inositol phosphate response in intact RH7777 cells; the small difference probably reflects the differences in assay conditions, including temperature, reaction time, and cell type used. Thus, Ki16425 was more effective in the membranes that expressed LPA1 and LPA3 than in those that expressed LPA2. There was no detectable difference between mouse and human LPA1 orthologs in their sensitivity to Ki16425 (Fig. 3, A and B). LPA-induced GTPγS binding to cell membranes expressing different LPA receptors. Crude membranes were prepared from HEK293T cells that were transfected with mouse (m) LPA1 (A), human (h) LPA1 (B), hLPA2 (C), or hLPA3 (D) together with cDNAs encoding α-, β-, and γ-subunits of G-proteins. The GTPγS binding activity by indicated concentrations of LPA was measured in the presence (▾, 0.1 μM; ♦, 0.3 μM; ▴, 1 μM; ▪, 3 μM; •, 10 μM) or absence (○) of Ki16425. Transfection of LPA receptors increased the basal activity in the absence of LPA from approximately 2,000 dpm to 3,000 (LPA2 and LPA3)∼4,000 dpm (any LPA1). This activity was increased to about 3,000 (vector), 8,000 (LPA2 and LPA3), and 11,000 dpm (any LPA1) by 10 μM LPA. Ki16425 treatment decreased the basal activity in the absence of LPA to about 1,500 dpm in all cases regardless of the receptor transfection. Thus, Ki16425 seems to inhibit the basal activity without LPA receptor stimulation. LPA-induced activities in the absence or presence of indicated concentrations of Ki16425 are expressed as percentages of the response to 10 μM LPA in the absence of Ki16425. Schild analysis was performed, as shown in the inset, and the estimated Ki values are shown in Table 1. Next, we examined the effect of Ki16425 on LPA receptor ligand binding. Because of the high nonspecific binding to the membranes and uncharacterized (specific) binding of LPA, even in vector-transfected cell membranes, we were unable to obtain saturation curves for LPA binding. 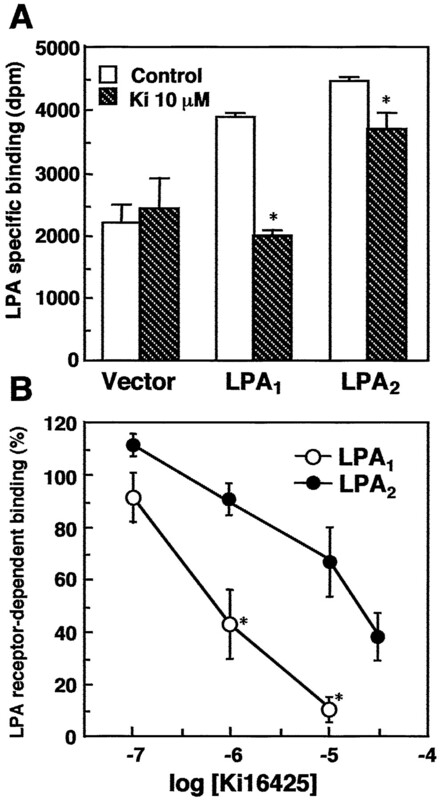 Nevertheless, specific LPA binding at 5 nM was increased after transfection of LPA1 or LPA2 (Fig. 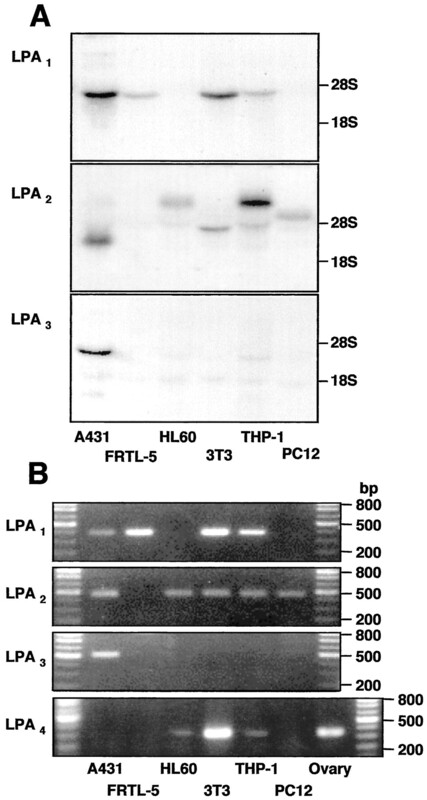 4A), but not of LPA3 transfection (see legend to Fig. 4). Ki16425 at 10 μM clearly inhibited the LPA-specific binding in LPA1-expressing cell membranes and slightly inhibited it in LPA2-expressing cell membrane, whereas there was no detectable effect in membranes from vector-transfected cells (Fig. 4A). We tentatively attributed the increment in specific binding resulting from the receptor transfection to LPA receptor-dependent binding activity. The dose-dependent effect of Ki16425 on LPA receptor-dependent binding is shown in Fig. 4B. Ki16425 was 20 to 30 times more potent for LPA1 than for LPA2, and the Ki values were estimated to be 0.67 μM for LPA1 and 21.4 μM for LPA2, which were close to those estimated from the inositol phosphate responses and GTPγS binding (Table 1). In summary, Kil6425 preferentially inhibited LPA1- and LPA3-mediated responses but had only a moderate effect on LPA2. Effect of Ki16425 on LPA receptor binding. A, effect of receptor transfection on the LPA-specific binding. The same HEK293T cell membranes as those in Fig. 3 were used. The membranes from the cells that were transfected with mLPA1 or hLPA2 were incubated with 5 nM [3H]LPA. LPA-specific binding without (control) or with 10 μM Ki16425 was measured by subtracting the nonspecific binding activity (6,000 dpm); this value remained unchanged by receptor transfection. The specific binding was increased by the transfection of LPA1 or LPA2 (Fig. 4A) but not by the transfection of LPA3, possibly because of the lower potency of LPA in LPA3-expressing cell membranes. The results are shown as LPA specific binding ± S.E. B; the increase in the binding activity caused by receptor transfection was attributed to an LPA receptor-dependent binding activity, and the effect of Ki16425 is expressed as a percentage of this activity. From the LPA receptor binding data, the Ki value can be theoretically estimated from the following equation: Ki = (IC50 × K)/(K + A), where A is the concentration of [3H]LPA used for the binding experiment (5 nM), IC50 is the half-maximal inhibitory concentration of Ki16425 (0.72 μM for LPA1 and 22 μM for LPA2, estimated from Fig. 4B), and K is the dissociation constant of LPA for the receptor. However, an accurate K value could not be determined (see text). Instead, we used an EC50 value of LPA for GTPγS binding (72 nM for LPA1 and 148 nM for LPA2, estimated from Fig. 3) as the K value and Ki values were estimated to be 0.67 and 21.3 μM for mouse LPA1 and human LPA2, respectively. *, the effect of Ki16425 was significant in A and the activity was significant between LPA1 and LPA2 in B.
Ki16425 Inhibition Is Selective for LPA Receptors. To investigate the compound's specificity and usefulness as an antagonist of LPA receptor, we applied Ki16425 to a variety of cell types and measured several cellular responses (Table 2 and Figs. 5, 6, 7). The dose-dependent [Ca2+]i increase elicited by LPA in THP-1 cells (Fig. 5A) and in 3T3 fibroblasts (Fig. 5B) was inhibited by Ki16425 in a competitive manner: the Ki value was estimated to be 0.17 μM in THP-1 and 0.54 μM in 3T3 fibroblasts. Likewise, in A431 cells, the LPA response was markedly inhibited by Ki16425 (Table 2). 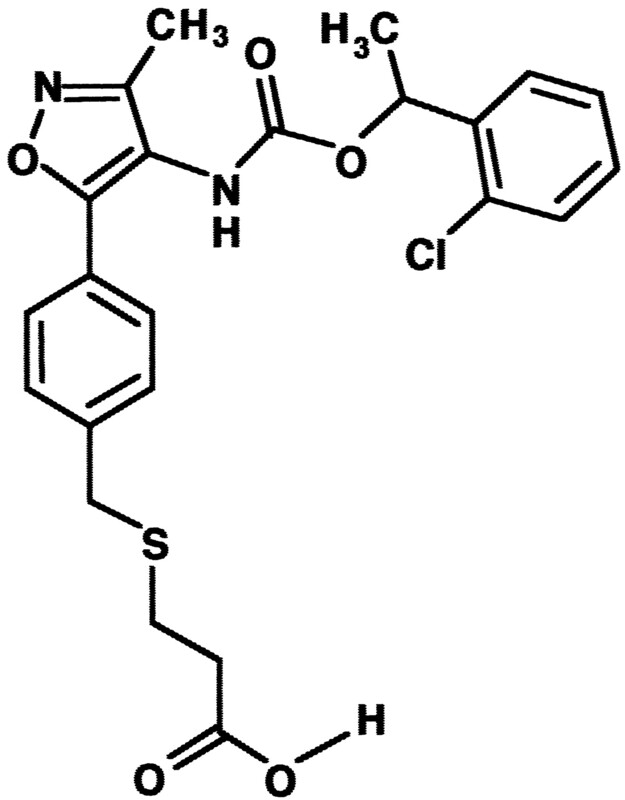 Thus, Ki16425 is a potent and reversible antagonist (Fig. 5C). In this experiment, 3T3 fibroblasts were incubated with or without 10 μM Ki16425 for the last 1 or 10 min during labeling time with Fura2/AM, the cells were washed with fresh medium three times, and the Ca2+ response to LPA was measured in the presence or absence of Ki16425. There was no significant effect of the pretreatment with Ki16425 on the LPA action, indicating that the compound could be washed out without leaving residual inhibition. Effects of Ki16425 on [Ca2+]i increase induced by LPA and other receptor agonists in various cell types, including THP-1 cells, 3T3 fibroblasts, A431 cells, PC-12 cells, and HL-60 cells. These cells were incubated in the presence or absence of Ki16425 (10 μM). LPA receptor expression was assessed from Northern blotting and PCR methods shown in Fig. 8. Effect of Ki16425 on [Ca2+]i increase induced by LPA in THP-1 cells and 3T3 fibroblasts. Ca2+ response to indicated concentrations of LPA was measured in the presence (▴) or absence (○) of Ki16425 (1 μM) in THP-1 cells in (A) and Swiss 3T3 fibroblasts (B). The results are expressed as percentages of the maximal [Ca2+]i increase (404 ± 27 nM in THP-1 cells and 1,256 ± 87 nM in Swiss 3T3 fibroblasts) by 10 μM LPA in the absence of Ki16425. Inset, Ca2+ response to 100 nM LPA was measured in the presence of indicated concentrations of Ki16425. The results are expressed as percentages of the [Ca2+]i increase (217 ± 36 nM in THP-1 cells and 759 ± 73 nM in Swiss 3T3 fibroblasts) by 100 nM LPA in the absence of Ki16425. C, the reversibility of the Ki16425 effect was examined in Swiss 3T3 fibroblasts. The cells were incubated for 1 or 10 min with or without 10 μM Ki16425 during labeling time with Fura 2/AM and washed three times with the HEPES-buffered medium. The [Ca2+]i increase by 100 nM LPA was then examined after the 1- or 10-min preincubation with or without 10 μM Ki16425. Effects of Ki16425 on inositol phosphate production. 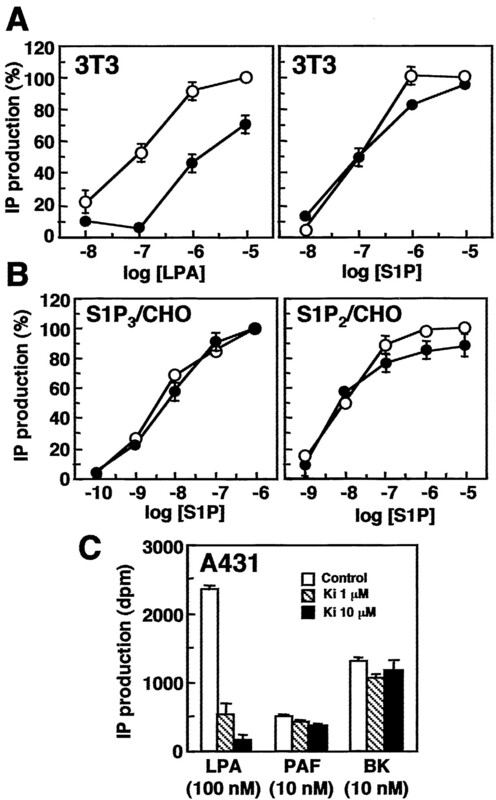 Inositol phosphate response to indicated concentrations of agents was measured in 3T3 fibroblasts (A), S1P3- or S1P2-expressing CHO cells (B) in the presence (•) or absence (○) of Ki16425 (10 μM). A, results are expressed as percentages of the respective maximal response to 10 μM LPA or S1P in the absence of Ki16425. The maximal response was obtained by subtracting the basal activity (1,245 ± 127 dpm) from the maximal activity (2,258 ± 240 dpm by 10 μM LPA and 2,901 ± 100 dpm by 10 μM S1P). B, the maximal response was evaluated in a manner similar to that described in A; the activity was changed from 678 ± 57 to 4,206 ± 214 dpm by 1 μM S1P (left) and from 631 ± 16 to 1,382 ± 10 dpm by 10 μM S1P (right). C, inositol phosphate response to indicated concentrations of LPA, PAF, or bradykinin (BK) in the presence or absence of Ki16425 (1∼10 μM) was measured in A431 cells. Results are expressed as the net increase in the activity by the respective agent. The basal value without agonist was 1,093 ± 12 dpm and was not appreciably changed by Ki16425 treatment. Effect of Ki16425 on cAMP response. FRTL-5 cells (A and B), treated or not treated with PTX, or S1P1-expressing CHO cells (C) were incubated with indicated concentrations of LPA, phenylisopropyladenosine (PIA), or S1P in the presence or absence of Ki16425. The results are expressed as percentages of the value obtained without these agonists. These values were 41.6 ± 3.6 nmol/10 mg of protein for FRTL-5 cells and 6.36 ± 0.38 nmol/10 mg of protein for S1P1/CHO cells. These values were not appreciably affected by PTX or Ki16425 treatment. In PC-12 cells, Ki16425 had only a small, although significant, inhibitory effect on the Ca2+ response to LPA. In HL-60 cells, a small but significant [Ca2+]i increase by LPA was insensitive to Ki16425 (Table 2). Thus, Ki16425 inhibited the LPA-induced Ca2+ response in THP-1 cells, 3T3 fibroblasts, and A431 cells, but had only a marginal effect in PC-12 cells and HL-60 cells. On the other hand, the Ca2+ responses to ATP, PAF, and SPC in THP-1 cells, PDGF and S1P in 3T3 fibroblasts, EGF and PAF in A431 cells, and SPC, lysophosphatidylcholine, psychosine, and 2-arachidonoylglycerol in HL-60 cells were not significantly inhibited by Ki16425 (Table 2). Figure 6 shows the effect of Ki16425 on the inositol phosphate response. This LPA-induced response in 3T3 fibroblasts (Fig. 6A) and A431 cells (Fig. 6C) was inhibited by Ki16425, and the mode of Ki16425 inhibition was consistent with competitive inhibition in 3T3 fibroblasts (the Ki value was 0.68 μM). In contrast, the responses to S1P in 3T3 fibroblasts (Fig. 6A, right), S1P3-expressing CHO cells, and S1P2-expressing CHO cells (Fig. 6B) were insensitive to Ki16425. Similarly, the response to PAF and bradykinin was not significantly affected by the inhibitor (Fig. 6C). Figure 7 shows the effects of Ki16425 on the inhibition of the forskolin-induced cAMP accumulation in response to LPA and phenylisopropyladenosine, an A1 adenosine receptor agonist, and S1P. LPA inhibited cAMP accumulation in FRTL-5 thyroid cells in a PTX-sensitive manner (Fig. 7A), suggesting a Gi-mediated inhibition of the LPA action. This inhibition by LPA was significantly suppressed by Ki16425 even at 0.1 μM and almost completely at 10 μM. However, the phenylisopropyladenosine-induced inhibition was insensitive to even 10 μM Ki16425, although the inhibition was PTX-sensitive in the same cells (Fig. 7B), thus ruling out the possibility that Ki16425 might act on Gi-proteins. 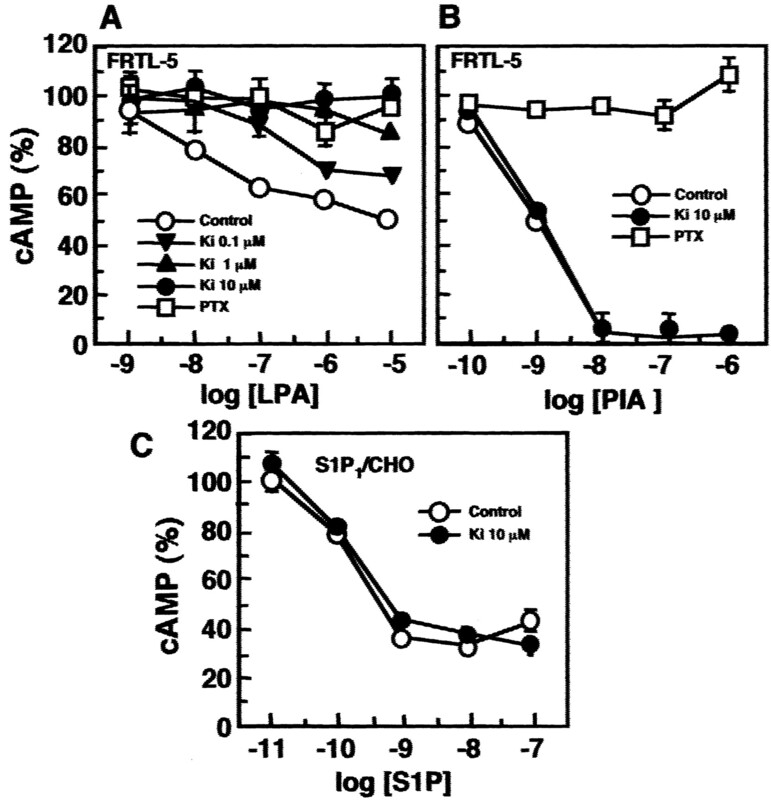 Likewise, the inhibition of cAMP accumulation by S1P in S1P1-expressing CHO cells was hardly affected by Ki16425 (Fig. 7C), and this S1P action was also reversed by PTX treatment (data not shown). In summary, Ki16425 was found to specifically inhibit LPA-induced response without any appreciable effect on responses to other receptor agonists. However, the extent of the LPA-induced inhibition seemed to depend on the cell types; the inhibition was marginal in PC-12 cells and undetectable in HL-60 cells. Differential Expression of LPA Receptor Subtypes May Explain the Susceptibility to Ki16425. mRNA expression of LPA receptor subtypes in the cells used (Figs. 5, 6, 7) was examined by Northern blotting and RT-PCR methods. Some of the results are summarized in Table 2. As seen in Fig. 8, A431 cells express all subtypes of EDG-family LPA receptor mRNAs but not LPA4/GPR23 mRNA; 3T3 fibroblasts and THP-1 cells express LPA1, LPA2, and LPA4 mRNAs; HL-60 cells express LPA2 and LPA4 mRNAs; FRTL-5 cells express LPA1 mRNA as a major band; and PC-12 cells express LPA2 mRNA as a major band. Although the size of LPA2 mRNA differed among the cell types, as shown by Northern blotting (Fig. 8A), a single band with a similar size was amplified by RT-PCR (Fig. 8B). This suggests the heterogeneity of LPA2 mRNA, possibly because of alternative splicing (An et al., 1998a,b). In the case of LPA3, a trace band with almost the same size as the band in A431 cells was detected in HL-60 and THP-1 cells by Northern blotting (Fig. 8A); however, no specific band was amplified by RT-PCR. Thus, the expression of LPA3 mRNA in HL-60 and THP-1 cells could not be confirmed. LPA1 mRNA was detected in Ki16425-sensitive A431 cells, FRTL-5 cells, 3T3 fibroblasts, and THP-1 cells. On the other hand, LPA2 and/or LPA4 were detected in Ki16425-insensitive or less-sensitive HL-60 cells and PC-12 cells as major bands (Fig. 8 and Table 2). Thus, cell sensitivity to Ki16425 seems to reflect the differential expression of LPA receptor subtypes, especially LPA1, and Ki16425 seems to be a useful tool for evaluating the involvement of specific LPA receptors in the short-term response to LPA. Northern blot (A) and RT-PCR (B) analyses of LPA receptor mRNAs in various cell types. As a positive control for LPA4/GPR23, rat ovary was used. It should be noted that even though the size of LPA2 mRNA determined by Northern blotting differed among cell types, a single band with a similar size was amplified by RT-PCR analysis for LPA2. 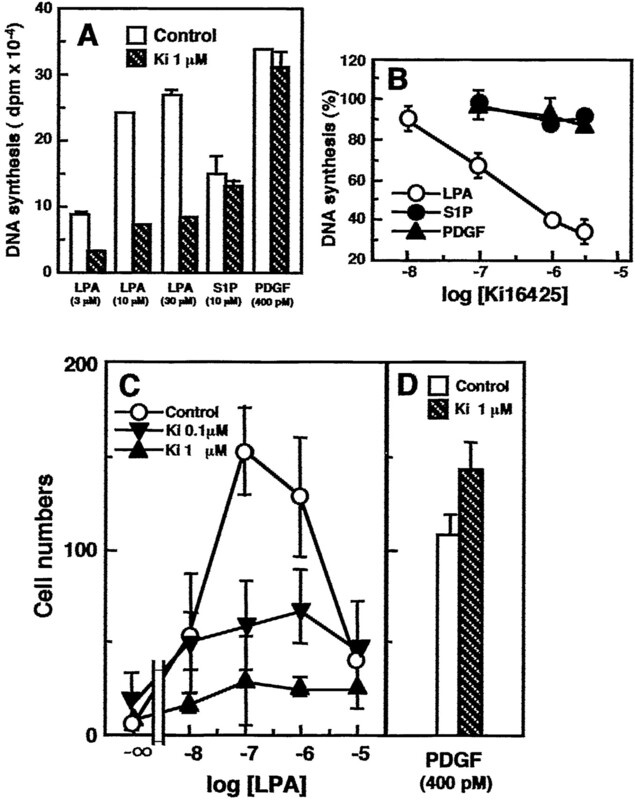 Ki16425 Inhibits Long-Term DNA Synthesis and Cell Migration As Induced by LPA. We next examined whether Ki16425 was applicable for inhibiting long-term responses including DNA synthesis (24 h) and cell migration (4 h). As shown in Fig. 9A, the LPA-induced DNA synthesis in 3T3 fibroblasts was markedly inhibited by 1 μM Ki16425, but those induced by S1P and PDGF were not appreciably affected at this concentration of the compound. Significant inhibition of the LPA-induced action by Ki16425 was observed at ∼0.01 to 0.1 μM, but DNA synthesis induced by S1P or PDGF was not affected even at 3 μM (Fig. 9B). LPA maximally stimulated the migration of 3T3 fibroblasts at 100 nM, and the activity declined as the LPA concentration increased. The bell-shaped migration response to LPA was also observed in glioma cells (Manning et al., 2000) and lymphocytes (Zheng et al., 2001), although the mechanism has not yet been well characterized. One possible mechanism might be desensitization caused by high agonist concentration. Ki16425 at ∼0.1 to 1 μM significantly inhibited the peak migration activity (Fig. 9C), but PDGF-induced cell migration was not inhibited under these conditions (Fig. 9D), similar to the case of DNA synthesis (Fig. 9B). Effects of Ki16425 on DNA synthesis and migration of Swiss 3T3 fibroblasts. A, the cells were incubated with indicated concentrations of agonists in the presence or absence of Ki16425 (1 μM). The net increase in thymidine incorporation by the respective agonist is shown. The basal activity without agonists was 89,000 ± 1,500 dpm in the absence of Ki16425 and 60,000 ± 8,000 dpm in the presence of 1 μM Ki16425. B, the cells were incubated with 10 μM LPA, 10 μM S1P, or 400 pM PDGF in the presence of the indicated concentration of Ki16425. The results are expressed as percentages of the net activity induced by the respective agonist as shown in A. C and D, the cells were treated with the indicated concentrations of Ki16425 and loaded into the upper wells of the Boyden chamber, and then cell migration for 4 h was measured. The lower wells were filled with the indicated concentrations of LPA or PDGF. The number of cells that migrated into the lower surface of the membrane filter was counted. Evaluation of LPA Receptor Subtypes Involved in LPA-Induced Actions. DGPP 8:0 has recently been reported as a selective antagonist of LPA1 and LPA3 (Fischer et al., 2001). Therefore, we attempted to confirm the pharmacological specificity of DGPP 8:0 for LPA receptor subtypes. As shown in Fig. 10, this compound clearly inhibited the LPA3-mediated Ca2+ response and slightly but significantly inhibited the LPA1-mediated one. The competitive inhibition by DGPP 8:0 was also observed for the inositol phosphate response in LPA3-expressing CHO cells (data not shown). However, as originally proposed (Fischer et al., 2001), this agent was ineffective for the LPA2-mediated Ca2+ response (Fig. 10B) and the inositol phosphate response (data not shown). Based on the ability to inhibit Ca2+ response, the Ki values of DGPP 8:0 were estimated to be 19.9 μM for LPA1 and 3.33 μM for LPA3. Thus, DGPP 8:0 was more effective for LPA3 than LPA1, whereas Ki16425 was slightly more effective for LPA1 than LPA3 (Table 1). Subtype selectivity of DGPP 8:0 on LPA receptors. 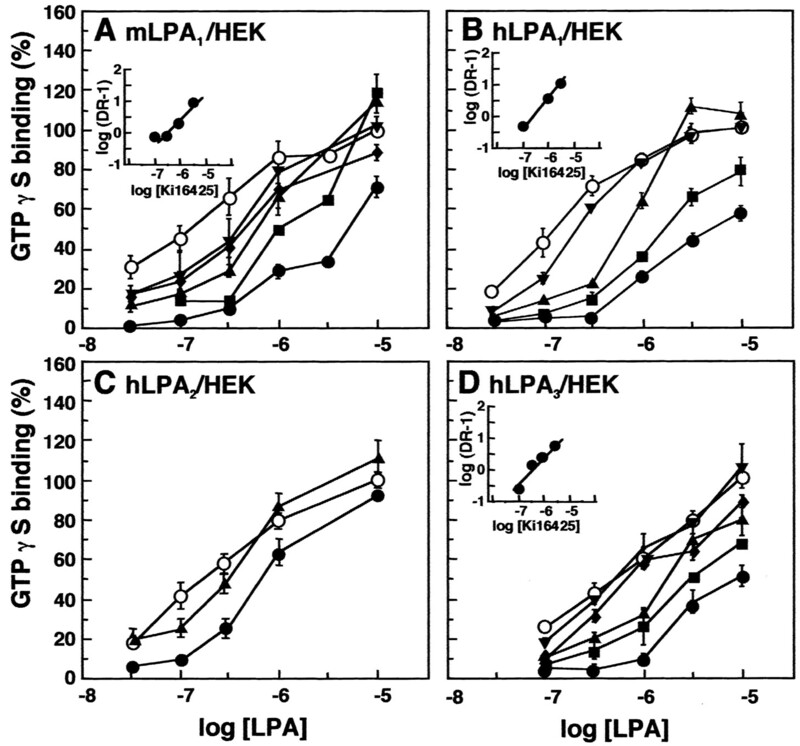 LPA1 (A), LPA2 (B), or LPA3(C) -RH7777 cells were incubated with the indicated concentrations of LPA in the presence (•) or absence (○) of 30 μM DGPP 8:0. The results are expressed as percentages of the value obtained at 10 μM LPA in the absence of Ki16425. The 100% values were 511 ± 4nMfor LPA1-expressing cells, 688 ± 40 nM for LPA2-expressing cells, and 908 ± 38 nM for LPA3-expressing cells. Finally, we explored the differences in the receptor selectivity of DGPP 8:0 and Ki16425 for the evaluation of the lipid receptor subtypes involved in the LPA response in A431 cells. A431 cells express three EDG-family LPA receptor subtypes but not LPA4 (Fig. 8 and Table 2). As shown in Fig. 11A, LPA induced inositol phosphate production in a dose-dependent manner and was partially inhibited by PTX. When the effects of Ki16425 were compared in A431 cells (Fig. 11B) and PTX-treated cells (Fig. 11C), 1 μM Ki16425 was inhibitory at the lower concentrations (∼10-100 nM) of LPA in normal cells; the Ki value was 0.73 μM, which is comparable with that of the mean for LPA1 or LPA3 (Table 1). However, DGPP 8:0 was found to be ineffective (Fig. 11B, right). These results suggest that the LPA-induced inositol phosphate response is predominantly mediated by LPA1 in normal A431 cells. On the other hand, in the PTX-treated A431 cells, Ki16425, even at 10 μM, hardly affected the LPA-induced action (Fig. 11C), suggesting that LPA2, but neither LPA1 nor LPA3, might be a major receptor subtype in the PTX-treated A431 cells. Thus, in normal A431 cells, both LPA1 as a major route and LPA2 as a minor route may mediate the LPA-induced inositol phosphate response. Evaluation of the subtype of LPA receptors involved in inositol phosphate response in A431 cells. A, the effect of PTX on the LPA-induced action. Normal A431 cells not treated with PTX or A431 cells treated with the toxin were incubated with the indicated concentrations of LPA. The results are expressed as the net production of inositol phosphate by LPA. The basal activity was 1,163 ± 53 dpm for control cells and 1,174 ± 58 dpm for PTX-treated cells. B, normal cells; C, PTX-treated cells. The LPA-induced activity was measured in the absence or presence of 1 μM Ki16425, 10 μM Ki16425, or 30 μM DGPP 8:0. The results are expressed as percentages of the response at 10 μM LPA in the normal or PTX-treated cells shown in A. In the present study, we showed that Ki16425 inhibited LPA-induced actions, including short-term (∼10 min) (i.e., Ca2+, inositol phosphate response, and cAMP responses) and long-term responses (∼4-24 h) (i.e., DNA synthesis and cell migration). Ki16425 did not exhibit any significant effects on the other receptor agonist-induced actions, including S1P, SPC, psychosine, 2-arachidonoylglycerol, PAF, lysophosphatidylcholine, ATP, A1-adenosine receptor agonist, bradykinin, EGF, and PDGF. Among the EDG-family LPA receptor subtypes analyzed in the present study, Ki16425 preferentially inhibited LPA1- and LPA3-mediated actions but only weakly inhibited those mediated by LPA2. Because GPR23 was reported as a fourth LPA receptor during the review process of this article, it remains to be elucidated whether Ki16425 affects LPA4/GPR23. The inhibition of the LPA-induced actions by Ki16425 showed a competitive pattern; Ki16425 least inhibited LPA binding to LPA1 but with a high potency, whereas to LPA2, it was inhibitory with a low potency, suggesting a competitive antagonist for LPA receptors with a preference for LPA1 and LPA3 over LPA2. Recent studies suggest that ligands loosely classified as antagonists can be divided into at least two classes: neutral antagonists, which possess no intrinsic activity, and inverse agonists, which possess negative intrinsic activity (de Ligt et al., 2000). Thus, inverse agonists can inhibit the basal activity without agonist stimulation. Ki16425 inhibited the basal activity of GTPγS binding (Fig. 3), suggesting that Ki16425 might be an inverse agonist. The basal activity in the inositol phosphate assay, however, was not changed by Ki16425 (Fig. 2). It remains to be elucidated whether the discrepancy of the results is caused by the differences in the time employed in these assays (i.e., 30 min in the GTPγS binding assay and 1 min in the inositol phosphate assay). Increasing the incubation time of inositol phosphate assay and the effects of other LPA receptor antagonists (mentioned below) on the Ki16425-induced GTPγS binding may help to conclude that Ki16425 is a neutral antagonist or an inverse agonist. LPA receptor subtype selectivity of Ki16425. The production of inositol phosphate (IP) by indicated concentrations of LPA was measured in the presence (▴, 1 μM; •, 10 μM) or absence (○) of Ki16425 in RH7777 cells expressing LPA1 (A), LPA2 (B), or LPA3 (C). The results are expressed as percentages of the maximal response to 10 μM LPA in the absence of Ki16425. The basal activity and the activity at 10 μM LPA were 553 ± 47 and 1,547 ± 84 dpm for LPA1 cells, 527 ± 43 and 2,560 ± 39 dpm for LPA2 cells, and 743 ± 120 and 2,813 ± 130 dpm for LPA3 cells, respectively. Ki16425 did not significantly change the basal activity. *, the effect of Ki16425 was significant. Recently, several agents have been shown to inhibit LPA-induced actions, although their effects on LPA binding have not yet been reported. DGPP 8:0 has been shown to have a preferential competitive property for LPA3 over LPA1 and was ineffective on LPA2 (Fischer et al., 2001). Consistent with this, we also observed in the present study that this agent competitively inhibited the LPA-induced Ca2+ response; the Ki value was estimated to be 3.33 μM for LPA3 and 19.9 μM for LPA1, but no inhibitory effect was detected for LPA2. Based on the GTPγ35S binding assay in HEK293 cells (Heise et al., 2001), VPC12249 has been shown to exert a selective and competitive inhibitory effect on LPA1 (Ki value of 0.14 μM) and LPA3 (Ki value of 0.43 μM), but not on LPA2. Thus, DGPP 8:0 is selective for LPA3, whereas VPC12249 is selective for LPA1 and LPA3. Ki16425 seems to have a pharmacological specificity similar to that of VPC12249, but the effect of the former on LPA2 is not negligible. Thus, Ki16425 has a broad selectivity on LPA receptor subtypes compared with the previously described LPA antagonists, although its interaction on the recently identified LPA4 remains uncharacterized. Such a broad selectivity might be beneficial to the evaluation of the participation of LPA in the biological responses compared with strictly subtype-selective LPA antagonists. The differential subtype selectivity of Ki16425 and DGPP 8:0 was successfully applied for the evaluation of the LPA receptor subtypes involved in biological responses. In the present study, we analyzed in detail the inositol phosphate response to LPA in A431 cells, which seem to express all three EDG-family LPA receptor subtypes but not LPA4 (Fig. 8). 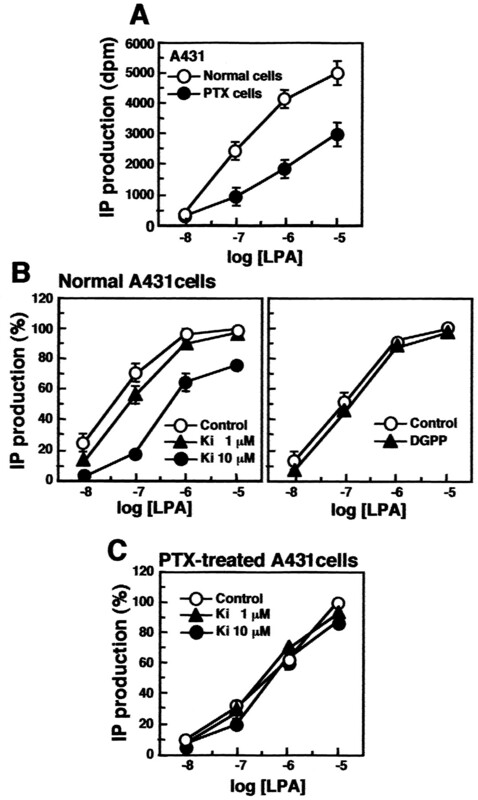 The LPA-induced action was sensitive to Ki16425 in normal cells (Fig. 11B) but insensitive to the antagonist in the PTX-treated cells (Fig. 11C). The change of susceptibility to Ki16425 may be explained as follows. In normal A431 cells, both LPA1 and LPA2 may couple to Gi and Gq, respectively, thereby mediating the LPA-induced inositol phosphate response; however, the minor LPA2/Gq pathway may be masked by the major LPA1/Gi pathway. When Gi was inactivated by PTX, however, the LPA2/Gq pathway was unmasked as a major route for the activation of phospholipase C. The Ca2+ and inositol phosphate responses to LPA in THP-1 cells and 3T3 fibroblasts seem to be mediated mainly by LPA1, as evidenced by their susceptibility to Ki16425 (Fig. 5) but not to DGPP 8:0 (data not shown). Although the effect of Ki16425 on LPA4 has not yet been examined, LPA4 might be insensitive to Ki16425, because the Ca2+ response to LPA in LPA4-expressing HL-60 cells was barely affected by Ki16425 (Table 2). The slight difference in the Ki value between THP-1 cells (0.17 μM for Ca2+ response) and 3T3 cells (0.54 μM for the Ca2+ response and 0.68 μM for the inositol phosphate response) might reflect the difference in the contribution of LPA2 or LPA4 to these responses. Concerning the inhibition of the cAMP response in FRTL-5 cells, it is likely that LPA1 is the major receptor subtype in this cell line. First, LPA-induced inhibition of cAMP accumulation was sensitive to Ki16425 (Fig. 7A), but not to DGPP 8:0 (data not shown). Second, only LPA1 among the subtypes was effective for inhibiting cAMP accumulation when transfected (Im et al., 2000; Noguchi et al., 2003). Finally, only LPA1 mRNA was detected in FRTL-5 cells (Fig. 8). Thus, these antagonists are potentially useful for discerning receptor subtypes involved in the given response, even when more than one LPA receptor subtypes is expressed. Ki16425 was also effective in the long-term responses, including DNA synthesis and cell migration in Swiss 3T3 fibroblasts (Fig. 9). Although LPA-induced DNA synthesis is one of the well known actions of the lipid mediator, its mechanism has not been fully characterized. In NIH 3T3 cells and other cell types, LPA-induced DNA synthesis seems to be mediated through a tyrosine phosphorylation of EGF receptors (Daub et al., 1997; Cunnick et al., 1998). Thus, it is possible that Ki16425 inhibited the LPA-induced action by interacting with the EGF receptor. This mechanism is unlikely, however, because EGF was not a significant stimulator for DNA synthesis in Swiss 3T3 fibroblasts (data not shown), and EGF-induced Ca2+ response was not affected by Ki16425 in A431 cells (Table 2). In any event, Ki16425 maintained its specific property for a long period (∼24 h), suggesting again that Ki16425 is a useful agent to evaluate the role of LPA and its receptors in long-term as well as short-term responses. In conclusion, Ki16425 selectively inhibited the EDG-family LPA receptor-mediated actions with preference to LPA1 and LPA3 in vitro. This compound might also potentially serve as a therapeutic drug for diseases that involve LPA and its receptors in their initiation or progression (e.g., atherosclerosis and cancer). We are grateful to Prof. Kevin R. Lynch of University of Virginia School of Medicine for the generous gift of mouse LPA1 cDNA and LPA1-expressing RH7777 cells, to Prof. Sang-Duk Kim of Korea University for critically reading the manuscript, and to Masayo Yanagita and Mayumi Komachi for technical assistance. This work was supported in part by a research grant grants-in-aid for scientific research from the Japan Society for the Promotion of Science and by research grants from The Mitsubishi Foundation, Pusan National University and Yamanouchi Foundation for Research on Metabolic Disorders. H.O. and K.S. contributed equally to this work. ABBREVIATIONS: LPA, 1-oleoyl-sn-glycero-3-phosphate or lysophosphatidic acid; Ki16425, 3-(4-[4-([1-(2-chlorophenyl)ethoxy]carbonyl amino)-3-methyl-5-isoxazolyl] benzylsulfanyl) propanoic acid; DGPP 8:0, dioctyl glycerol pyrophosphate; PAF, platelet activating factor; S1P, sphingosine 1-phosphate; SPC, sphingosylphosphorylcholine; EDG, endothelial differentiation gene; BSA, bovine serum albumin; AM, acetoxymethyl ester; PTX, pertussis toxin; GTPγS, guanosine 5′-O-(3-thio)triphosphate; Bp, base pair(s); RT, reverse transcription; PCR, polymerase chain reaction; CHO, Chinese hamster ovary; HEK, human embryonic kidney; FBS, fetal bovine serum; Ro 20-1724, 4-[(3-butoxy-4-methoxyphenyl)-methyl]-2-imidazolidinone; MOPS, 3-(N-morpholino)propanesulfonic acid; PDGF, platelet-derived growth factor; EGF, epidermal growth factor; VPC12249, N-oleoyl-2-(benzyl-4-oxybenzyl) ethanolamide phosphoric acid. An S, Bleu T, Hallmark OG, and Goetzl EJ (1998a) Characterization of a novel subtype of human G protein-coupled receptor for lysophosphatidic acid. J Biol Chem 273: 7906-7910. An S, Bleu T, Zheng Y, and Goetzl EJ (1998b) Recombinant human G protein-coupled lysophosphatidic acid receptors mediate intracellular calcium mobilization. Mol Pharmacol 54: 881-888. Bandoh K, Aoki J, Hosono H, Kobayashi S, Kobayashi T, Murakami-Murofushi K, Tsujimoto M, Arai H, and Inoue K (1999) Molecular cloning and characterization of a novel human G-protein-coupled receptor, EDG7, for lysophosphatidic acid. J Biol Chem 274: 27776-27785. Contos JJ, Ishii I, and Chun J (2000) Lysophosphatidic acid receptors. Mol Pharmacol 58: 1188-1196. Cunnick JM, Dorsey JF, Standley T, Turkson J, Kraker AJ, Fry DW, Jove R, and Wu J (1998) Role of tyrosine kinase activity of epidermal growth factor receptor in the lysophosphatidic acid-stimulated mitogen-activated protein kinase pathway. J Biol Chem 273: 14468-14475. Daub H, Wallasch C, Lankenau A, Herrlich A, and Ullrich A (1997) Signal characteristics of G protein-transactivated EGF receptor. EMBO (Eur Mol Biol Organ) J 16: 7032-7044.
de Ligt RA, Kourounakis AP and IJzerman AP (2000) Inverse agonism at G protein-coupled receptors: (patho)physiological relevance and implications for drug discovery. Br J Pharmacol 130: 1-12. Fischer DJ, Nusser N, Virag T, Yokoyama K, Wang D, Baker DL, Bautista D, Parrill AL, and Tigyi G (2001) Short-chain phosphatidates are subtype-selective antagonists of lysophosphatidic acid receptors. Mol Pharmacol 60: 776-784. Hecht JH, Weiner JA, Post SR, and Chun J (1996) Ventricular zone gene-1 (vzg-1) encodes a lysophosphatidic acid receptor expressed in neurogenic regions of the developing cerebral cortex. J Cell Biol 135: 1071-1083. Heise CE, Santos WL, Schreihofer AM, Heasley BH, Mukhin YV, Macdonald TL, and Lynch KR (2001) Activity of 2-substituted lysophosphatidic acid (LPA) analogs at LPA receptors: discovery of a LPA1/LPA3 receptor antagonist. Mol Pharmacol 60: 1173-1180. Im DS, Heise CE, Harding MA, George SR, O'Dowd BF, Theodorescu D, and Lynch KR (2000) Molecular cloning and characterization of a lysophosphatidic acid receptor, Edg-7, expressed in prostate. Mol Pharmacol 57: 753-759. Kimura T, Watanabe T, Sato K, Kon J, Tomura H, Tamama K, Kuwabara A, Kanda T, Kobayashi I, Ohta H, et al. (2000) Sphingosine 1-phosphate stimulates proliferation and migration of human endothelial cells possibly through the lipid receptors, Edg-1 and Edg-3. Biochem J 348: 71-76. Kon J, Sato K, Watanabe T, Tomura H, Kuwabara A, Kimura T, Tamama K, Ishizuka T, Murata N, Kanda T, et al. (1999) Comparison of intrinsic activities of the putative sphingosine 1-phosphate receptor subtypes to regulate several signaling pathways in their cDNA-transfected Chinese hamster ovary cells. J Biol Chem 274: 23940-23947. McIntyre TM, Pontsler AV, Silva AR, St Hilaire A, Xu Y, Hinshaw JC, Zimmerman GA, Hama K, Aoki J, Arai H, et al. (2003) Identification of an intracellular receptor for lysophosphatidic acid (LPA): LPA is a transcellular PPARgamma agonist. Proc Natl Acad Sci USA 100: 131-136. Manning TJ Jr, Parker JC, and Sontheimer H (2000) Role of lysophosphatidic acid and rho in glioma cell motility. Cell Motil Cytoskeleton 45: 185-199. Maschberger P, Bauer M, Baumann-Siemons J, Zangl KJ, Negrescu EV, Reininger AJ, and Siess W (2000) Mildly oxidized low density lipoprotein rapidly stimulates via activation of the lysophosphatidic acid receptor Src family and Syk tyrosine kinases and Ca2+ influx in human platelets. J Biol Chem 275: 19159-19166. Moolenaar WH (1999) Bioactive lysophospholipids and their G protein-coupled receptors. Exp Cell Res 253: 230-238. Murata N, Sato K, Kon J, Tomura H, Yanagita M, Kuwabara A, Ui M, and Okajima F (2000) Interaction of sphingosine 1-phosphate with plasma components, including lipoproteins, regulates the lipid receptor-mediated actions. Biochem J 352: 809-815. Noguchi K, Ishii S, and Shimizu T (2003) Identification of p2y9/GPR23 as a novel G protein-coupled receptor for lysophosphatidic acid, structurally distant from the Edg family. J Biol Chem 278: 25600-25606. Okajima F and Kondo Y (1995) Pertussis toxin inhibits phospholipase C activation and Ca2+ mobilization by sphingosylphosphorylcholine and galactosylsphingosine in HL60 leukemia cells. Implications of GTP-binding protein-coupled receptors for lysosphingolipids. J Biol Chem 270: 26332-26340. Okajima F, Sato K, Tomura H, Kuwabara A, Nochi H, Tamoto K, Kondo Y, Tokumitsu Y and Ui M (1998) Stimulatory and inhibitory actions of lysophosphatidylcholine, depending on its fatty acid residue, on the phospholipase C/Ca2+ system in HL-60 leukaemia cells. Biochem J 336: 491-500. Pages C, Daviaud D, An S, Krief S, Lafontan M, Valet P, and Saulnier-Blache JS (2001) Endothelial differentiation gene-2 receptor is involved in lysophosphatidic acid-dependent control of 3T3F442A preadipocyte proliferation and spreading. J Biol Chem 276: 11599-11605. Sano T, Baker D, Virag T, Wada A, Yatomi Y, Kobayashi T, Igarashi Y, and Tigyi G (2002) Multiple mechanisms linked to platelet activation result in lysophosphatidic acid and sphingosine 1-phosphate generation in blood. J Biol Chem 277: 21197-21206. Sato K, Tomura H, Igarashi Y, Ui M, and Okajima F (1997) Exogenous sphingosine 1-phosphate induces neurite retraction possibly through a cell surface receptor in PC12 cells. Biochem Biophys Res Commun 240: 329-334. Sato K, Tomura H, Igarashi Y, Ui M, and Okajima F (1999) Possible involvement of cell surface receptors in sphingosine 1-phosphate-induced activation of extracellular signal-regulated kinase in C6 glioma cells. Mol Pharmacol 55: 126-133. Sato K, Ui M, and Okajima F (2000) Differential roles of Edg-1 and Edg-5, sphingosine 1-phosphate receptors, in the signaling pathways in C6 glioma cells. Brain Res Mol Brain Res 85: 151-160. Sho KM, Okajima F, Abdul Majid M, and Kondo Y (1991) Reciprocal modulation of thyrotropin actions by P1-purinergic agonists in FRTL-5 thyroid cells. Inhibition of cAMP pathway and stimulation of phospholipase C-Ca2+ pathway. J Biol Chem 266: 12180-12184. Siess W, Zangl KJ, Essler M, Bauer M, Brandl R, Corrinth C, Bittman R, Tigyi G, and Aepfelbacher M (1999) Lysophosphatidic acid mediates the rapid activation of platelets and endothelial cells by mildly oxidized low density lipoprotein and accumulates in human atherosclerotic lesions. Proc Natl Acad Sci USA 96: 6931-6936. Tamama K, Kon J, Sato K, Tomura H, Kuwabara A, Kimura T, Kanda T, Ohta H, Ui M, Kobayashi I, et al. (2001) Extracellular mechanism through the Edg family of receptors might be responsible for sphingosine-1-phosphate-induced regulation of DNA synthesis and migration of rat aortic smooth-muscle cells. Biochem J 353: 139-146. Tigyi G (2001) Selective ligands for lysophosphatidic acid receptor subtypes: gaining control over the endothelial differentiation gene family. Mol Pharmacol 60: 1161-1164. Tokumura A, Majima E, Kariya Y, Tominaga K, Kogure K, Yasuda K, and Fukuzawa K (2002) Identification of human plasma lysophospholipase D, a lysophosphatidic acid-producing enzyme, as autotaxin, a multifunctional phosphodiesterase. J Biol Chem 277: 39436-39442. Tomura H, Itoh H, Sho K, Sato K, Nagao M, Ui M, Kondo Y, and Okajima F (1997) βγ subunits of pertussis toxin-sensitive G proteins mediate A1 adenosine receptor agonist-induced activation of phospholipase C in collaboration with thyrotropin. A novel stimulatory mechanism through the cross-talk of two types of receptors. J Biol Chem 272: 23130-23137. Ueno A, Nagao R, Watanabe T, Ohta H, and Yagi M (2001), inventors; Kirin Brewery, assignee. Novel isoxazole and thiazole compounds and use thereof as drugs. European patent 1 258 484 A1. Umezu-Goto M, Kishi Y, Taira A, Hama K, Dohmae N, Takio K, Yamori T, Mills GB, Inoue K, Aoki J, et al. (2002) Autotaxin has lysophospholipase D activity leading to tumor cell growth and motility by lysophosphatidic acid production. J Cell Biol 158: 227-233. Xu Y, Gaudette DC, Boynton JD, Frankel A, Fang XJ, Sharma A, Hurteau J, Casey G, Goodbody A, Mellors A, et al. (1995) Characterization of an ovarian cancer activating factor in ascites from ovarian cancer patients. Clin Cancer Res 1: 1223-1232. Xu Y, Xiao YJ, Baudhuin LM, and Schwartz BM (2001) The role and clinical applications of bioactive lysolipids in ovarian cancer. J Soc Gynecol Investig 8: 1-13. Ye X, Ishii I, Kingsbury MA, and Chun J (2002) Lysophosphatidic acid as a novel cell survival/apoptotic factor. Biochim Biophys Acta 1585: 108-113. Zheng Y, Kong Y, and Goetzl EJ (2001) Lysophosphatidic acid receptor-selective effects on Jurkat T cell migration through a Matrigel model basement membrane. J Immunol 166: 2317-2322.